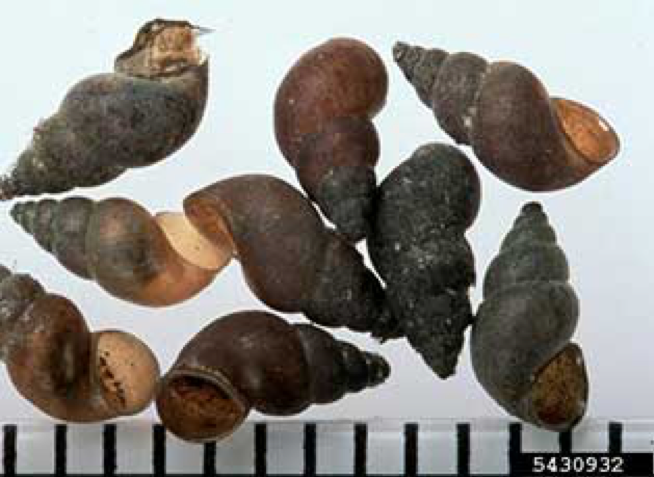 The New Zealand Mud snail (NZMS) (Potamopyrus antipdarum) is a small (<5mm) invertebrate that is currently threatening fragile stream and river ecosystems in the Western United States. The NZMS) is an invasive species that is able to survive in a wide variety of habitats. It reproduces asexually, and a single snail has the potential to yield 40 million snails in one year, making this species essentially impossible to eradicate once colonization has occurred. Currently, the NZMS has been reported in several locations along the Carmel River (see https://nas.er.usgs.gov/viewer/omap.aspx?SpeciesID=1008). As is explained in a 2016 Report from the California Fish and Wildlife, the NZMS is able to out-compete local invertebrate species, which leads to a disruption in the aquatic ecosystem. The small size and “cryptic coloration” (Oregon State University report, 2010) of the NZMS makes it ideal for inadvertent transport through shoes, ropes, waders, nets and boats. In order to protect the Carmel River Watershed ecosystem, it is essential that the public take measures to prevent the spread of this invasive species. The spread of NZMS can be prevented through chemical and physical decontamination methods. The follow is a brief summary of such methods. Chemical Decontamination methods include household cleaners such as bleach and 409 (for methods see http://seagrant.oregonstate.edu/sgpubs/onlinepubs.html). While chemical decontamination methods are in some cases less time consuming, physical decontamination methods are preferred to reduce potential chemical contamination of the environment. Equipment that comes in contact with the water can be decontaminated by drying (in sunlight) for 48 hours. Additional methods include freezing the gear (-37.4°C) for at least 4 hours, or heating the gear in water at least 120°F for a minimum of 5 minutes. It’s a hassle, but well worth it to prevent further spread! Older PostCalifornia Wildlife Day Launched in Carmel Valley!